Like you, we are constantly drawing inspiration from nature as we create beautiful new varieties of perennials. We've made some significant advancements in traits like disease resistance and length of bloom, and we're always looking for lower maintenance, better performing selections that make it easy for you to be successful in the garden. Here are some examples of our best native perennial cultivars. Amsonia, commonly called blue star, is a classic low maintenance native perennial with several notable species. Amsonia hubrichtii, which is native to Oklahoma and Arkansas, is best known for its brilliant gold fall color and deceptively soft, needle-like leaves. Amsonia tabernaemontana covers the most ground with its native habitat which extends as far south as Florida and as far north as New York. ‘Storm Cloud’ Amsonia tabernaemontana was discovered growing in the wild in Alabama, making it a pure native perennial. It was named for its intensely dark shoots which pop out of the ground early each spring. By the time this bushy shrub-like perennial has fully emerged in late spring to early summer, periwinkle blue, star-shaped flowers cover its silver-veined, dark green leaves. 'Storm Cloud' is hardy in zones 4-9 and should be grown in full sun to part shade. It matures to 24-30" tall and is typically deer resistant. Aruncus, commonly known as goat's beard, has an extensive native range in North America. Our northern friends in Canada will see some in the wild, and its natural occurance continues all the way down to the Southeast U.S. Some might mistake a similar perennial named Astilbe for goat's beard, but Astilbe is not native and can be more sensitive to drier soils. Goat's beard is a great native substitute. Goat's beard has similar wispy flower panicles as Astilbe, but it typically flowers a few weeks earlier in late spring to early summer. It performs well in shade gardens where it can tolerate average to somewhat dry soils, but it can also grow in full sun if adequate moisture is provided. 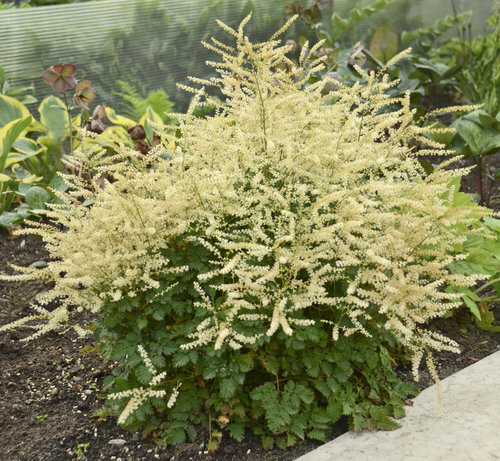 ‘Chantilly Lace’ is a native cultivar of Aruncus, meaning its parents came from native roots. It is a mid-sized selection which stands taller than the dwarf species, Aruncus aethusifolius, but shorter than the full-sized species, Aruncus dioicus. It is hardy in zones 3-7 and can be grown in sun or shade. It matures to 30-32" tall and is typically deer resistant. Baptisia australis, commonly known as false indigo, is one of the oldest known perennials to exist, and was the first-ever subsidized agricultural crop in America. It is also extremely long lived, thriving for 50 years or more in the landscape. Several native species of Baptisia can be found in the Eastern U.S. as well as across the Great Plains states. Most native Baptisia species have either blue, white or yellow flowers. Though many native species of Baptisia are quite large, we've brought them down to an urban scale. Decadence® varieties mature to a compact 2 1/2 to 3 foot size, similar to a clump of daylilies. Decadence® Deluxe varieties stand a bit taller at 3 1/2 to 4 feet tall. Eight colors are available in these series--a broad expansion of the native color range. The new Decadence® Deluxe 'Pink Lemonade', shown here, features bicolor yellow and raspberry purple flowers in late spring to early summer. Like all varieties in this series, decorative seed pods develop in place of the flowers and extend this plant's season of interest into winter. 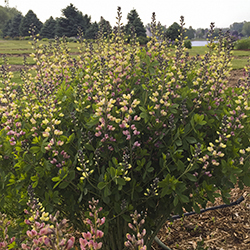 Decadence® Baptisia are hardy in zones 4-9 and grow best in full sun to light shade. They are typically deer resistant and attract butterflies. The genus Echinacea, commonly known as coneflower, has several species that are native to the U.S. Many cultivars sold today contain Echinacea purpurea in their parentage. This species is commonly found throughout the entire eastern half of the U.S. from Michigan to Florida. Echinacea pallida is another widespread species which occurs from Ontario, Canada to Texas. The yellow flowering Echinacea paradoxa has a more limited native range from the Great Plains states down through Texas. Most of the Echinacea hybrids available today are complex crosses of several native species, as breeders select for unique flower colors, well-branched habits and sturdy stems. 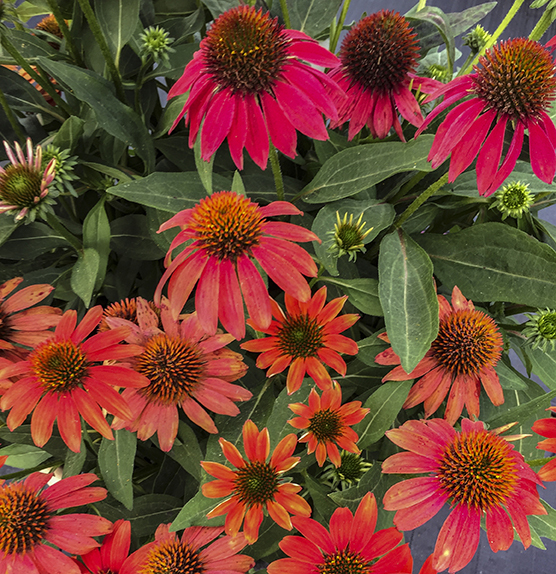 Lakota™ Santa Fe is a complex hybrid Echinacea that bears fragrant, 3 1/2" flowers in shades that range from red-orange to pink-red. It blooms nearly all season from early summer into early fall in zones 4-8 in full sun to part shade. Its petite 12-16" height makes this variety ideal for planting in containers or near the front of the flower border. With the exception of the warmest Western states, Heliopsis helianthoides can be found growing wild along roadsides, in open woods and fields across the U.S. and much of Canada. It tolerates somewhat dry to average soils and does not require rich soil to thrive. It makes an excellent substitute for Rudbeckia 'Goldsturm' in areas where black spot disease (Septoria) is prevalent. We offer two varieties of Heliopsis to brighten up your garden in full sun to light shade from midsummer to fall. Tuscan Gold™ bears slightly larger, more yellow flowers on 24-32" tall plants in zones 4-9. 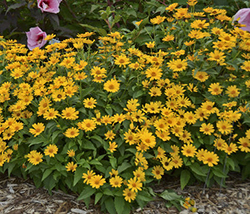 'Tuscan Sun' (shown here) blooms prolifically with golden yellow flowers on 20-24" plants and is a bit hardier in zones 3-9. Pollinating bees and butterflies enjoy the blossoms. Heuchera, commonly known as coral bells, are extremely versatile, colorful native perennials that thrive in landscapes and in containers. Many native species can be found in different climates around the U.S. including Heuchera americana (Eastern U.S.), Heuchera micrantha (Western U.S.), Heuchera sanguinea (New Mexico, Arizona, Pennsylvania), and Heuchera villosa (Southeastern U.S.), and a few other more obscure species. Most varieties you see at garden centers are a result of crossing many different species, all of which are native to the U.S. The resulting plants have a wide range of foliage colors, leaf shapes and sizes, and flower colors. Heuchera villosa cultivars tend to be naturally heat and humidity tolerant because the summers in their native habitat are hot and sticky. They also tend to have larger, fuzzier leaves and greater vigor. An example of a H. villosa cultivar is Primo™ 'Black Pearl', which has large, jet black leaves and a vigorous growth habit. Selections of coral bells that have intense pink and red flowers tend to come from the species Heuchera sanguinea. An example of a H. sanguinea cultivar is Dolce® 'Appletini' (shown here) which bears fire engine red flowers and chartreuse foliage. 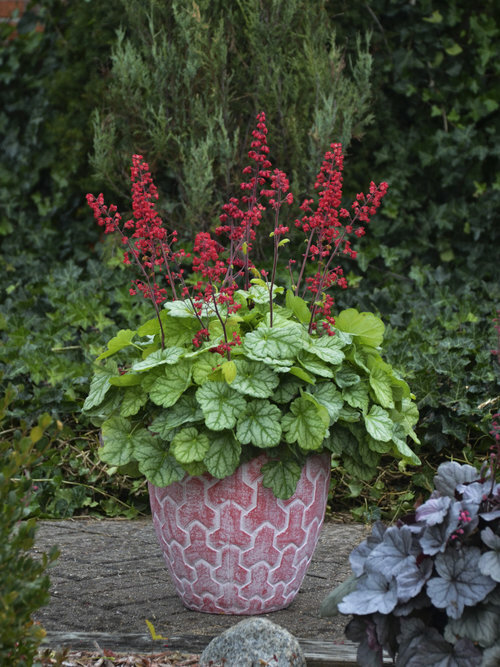 Dolce® and Primo™ coral bells will grow in sun and shade, though their best coloration usually is achieved in part sun. Varieties with lighter colored foliage typically require more shade than those with dark leaves. Plant them in fertile, well-drained soil and provide average moisture levels. Mulching the plants in fall will help to prevent heaving from freeze/thaw cycles in northern climates. Heuchera is hardy in zones 4-9. Most varieties of perennial hibiscus, also known as rose mallow, sold today can trace their roots to Hibiscus moscheutos, which is native to the Eastern U.S., venturing into the Southwest. A few can trace their roots to additional native species such as Hibiscus coccineus. In their native habitat, they grow at the edges of bodies of water where their roots can stay consistently moist. Many reach heights in excess of six feet tall in the wild. Modern perennial hibiscus selections have brought the plants down to a more gardenworthy size and made them fuller with more flowers per plant. Proven Winners hibiscus are selected for their compact habit, larger and higher quality flowers, and indeterminate bloom which means that buds are produced at many nodes up the stems instead of just at the tips. This results in a more attractive plant in the garden which flowers over a longer period. 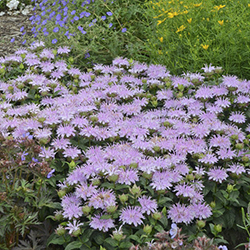 Summerific® ‘Perfect Storm’ (shown here) stands just 3' tall and 4 1/2 to 5' wide. A backdrop of dark foliage sets the stage for its dinner plate-sized, pink and white bicolor blooms from midsummer into early fall. 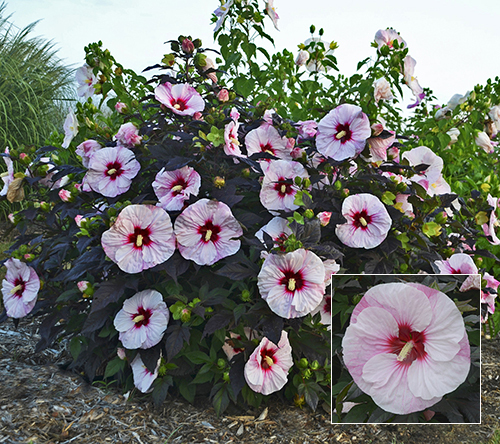 All Summerific® perennial hibiscus varieties are hardy in zones 4-9 and grow best in full sun to light shade. Because of their large size and extensive root system, they grow best in the ground rather than in containers where they require consistent moisture to thrive. Deer usually leave them alone, but bees and hummingbirds enjoy their blossoms. Monarda, commonly called bee balm, is native across much of the U.S. An early blooming species with speckled flower petals is Monarda bradburiana. It can be found in the wild in the central part of the U.S. and further South including Texas. Our Leading Lady series of bee balm is based off of this native species. It blooms every year in early to midsummer on 10-14" tall plants. 'Leading Lady Lilac' is shown here. Monarda didyma is another very commonly grown species. It is native from Wisconsin to Georgia, including the entire East Coast and the eastern half of Canada. Populations can also be found in Washington and Oregon. Many of the cultivars sold today, including our Pardon My series, are based off of this native species. It blooms every year in mid to late summer on 10-18" tall plants. Bee balm is an excellent perennial to grow if you are looking to draw pollinators into your garden. Bees, butterflies and hummingbirds love the sweet nectar found in its tubular-shaped florets. In zones 4-8, it grows in full sun to part shade and prefers average to consistently moist soil. Deer tend to leave it alone due to its minty scented foliage. Panicum virgatum, commonly known as switch grass, is commonly found across the North American prairie and is native to most of the U.S. except the Far West states. 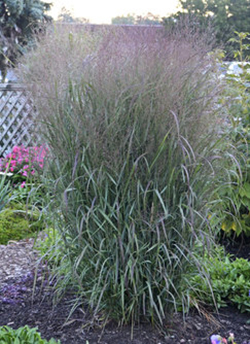 It is an extremely versatile and easy to grow native ornamental grass. It grows in any soil type and any level of moisture, from wet to dry and everything inbetween. Its one requirement is full sun, meaning a bare minimum of 6 hours of direct sun per day. Most varieties range from 3-6' tall. Each of the selections in our Prairie Winds® Panicum collection is unique. 'Apache Rose' (shown here) forms a dense, upright, 4' tall column of grey-green leaves that are topped with a profusion of burgundy seed panicles in late summer. 'Cheyenne Sky' is useful for adding color to the garden beginning in early summer when its 3' tall foliage starts its transition from green to wine red. 'Totem Pole' is a 6' tall selection that forms a narrow column of steel blue foliage. Prairie Winds switch grass is hardy in zones 4-9 and is typically deer resistant. Left standing, its foliage provides winter interest and shelter for birds and other wildlife. Penstemon, commonly known as beardtongue, is a very large genus with a lot of genetic diversity. You'll find varieties with tubular-shaped flowers in every color of the rainbow on both short and tall plants. Their hardiness varies greatly, so always read the label to check the hardiness before you buy. Some species are native to the North American prairie, while others like Penstemon digitalis are typically found in the Eastern U.S. Other species are native to Mexico and are grown as annuals in much of the U.S.
Decades ago, a variety of perennial beardtongue named 'Husker Red' was developed at the University of Nebraska. It was one of the first to bear purple-tinged foliage and it produced white flowers prolifically on tall stems. Over 30 years later, we have introduced 'Midnight Masquerade', which forms a larger 36-40" tall, sturdy clump of deep burgundy foliage topped with a profusion of lavender purple flowers beginning in midsummer. It is highly attractive to pollinators. 'Midnight Masquerade' beardtongue is hardy in zones 3-8 and requires full sun. It is very heat and drought tolerant once established. Phlox is a very common wildflower you'll see blooming anytime from late spring through the summer months across the Great Plains states, along the East Coast, and all the way south to Florida. Though most bear pastel pink, purple, or white flowers, the size of the plants and their habit range quite a bit from tall, upright plants to those that spread low and wide. Most species need full sun to thrive. You might be familiar with tall garden phlox (P. paniculata) or creeping phlox (P. subulata); there are many other native species too. 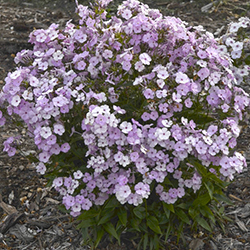 Hybrid phlox is relatively new in the gardening world. Hybridizers have learned to select the best traits from the many native species of Phlox to develop new varieties that are more disease resistant, have stronger stems, a longer bloom time, and other desirable traits. Opening Act Phlox varieties are upright varieties that bloom earlier in the season than tall garden phlox, typically beginning in early summer. Their glossy foliage is very disease resistant and their fragrant flowers rebloom sporadically into early fall. 'Opening Act Blush' is shown here. 'Cloudburst' Phlox has a dome-shaped habit like cushion phlox. 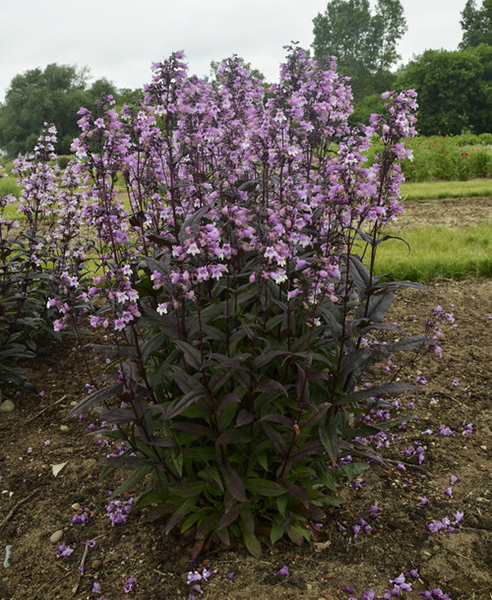 Its rich purple flowers form a billowy cloud above the highly disease resistant, glossy foliage all summer. Butterflies and hummingbirds love Opening Act and 'Cloudburst' Phlox. They are hardy in zones 4-8 and grow best in full sun. 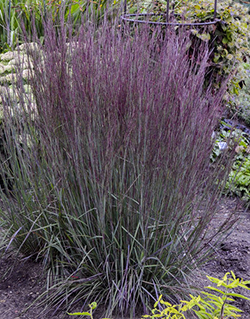 Schizachyrium scoparium, commonly known as little bluestem, is one of the most prolific native ornamental grasses grown today. It can be found growing in the wild in 46 of the 48 contiguous United States (Oregon and Nevada being the exceptions). It can also be found growing coast to coast in Canada. Since it spreads by seed, it can pop up in any sunny space and varies quite a bit in height and fall color. It typically settles in sandy to clay-loam soils where it grows deep roots, making it moderately drought tolerant. One of the primary troubles with this grass from a home gardener's perspective is a trait that was adapted to help plants sow their seed. As the seeds mature in fall, the stems which carry them gently fall to the ground, laying the seed upon the soil so it can be sown. Gardeners aren't too fond of floppy plants, so hybridizers have worked for decades to breed this trait out of their selections. Prairie Winds® 'Blue Paradise' maintains its upright habit all season, even in wind and rain, taking center stage in the fall landscape. 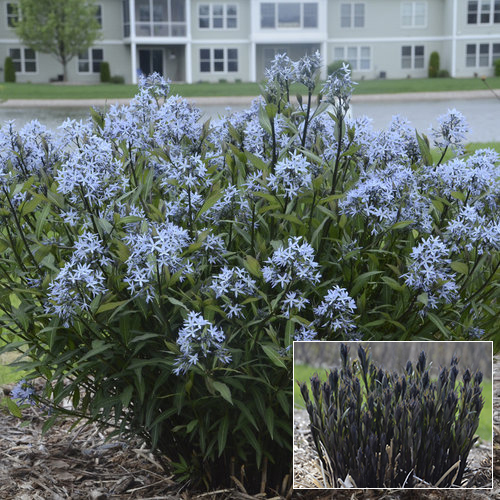 Its cool silvery blue foliage takes on deep wine purple coloration in the cool weather. It is hardy in zones 3-9 where it grows 3 to 3 1/2' tall in full sun. Tiarella cordifolia, commonly known as heartleaf foamflower, is a beautiful native wildflower that can be found growing in the wild from Ontario to Georgia, throughout the Upper Midwest and down the East Coast. It is currently listed as an endangered wildflower in New Jersey and Wisconsin. In its native habitat, Tiarella grows in shaded, cool, deciduous woods and along stream banks in rich, well-drained, moist soil. Though the species is a groundcover which spreads by underground runners, many of the selected cultivars are clump-forming, meaning they stay in the same place where you planted them. 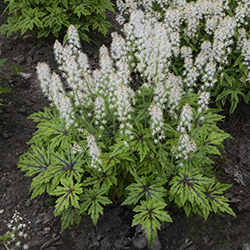 An example is 'Cutting Edge' foamflower, which is a Proven Winners introduction. It was named for its attractively serrated foliage which is green with a dark burgundy splotch in the center of each leaf. It forms a neatly rounded mound topped with creamy white, bottlebrush-like flowers in early spring. This will be one of the first plants to bloom in your garden. Grow foamflowers in part shade to full shade in zones 4-9. They make an excellent underplanting for taller perennials and shrubs, and are an excellent cover for dying bulb foliage in late spring. The foliage of 'Cutting Edge' grows 8-10" tall and its flowers top out at 14". Tradescantia, commonly known as spiderwort, is an extremely prolific native wildflower that can be found growing wild across all of the U.S. and Canada with the exception of the Pacific Northwest and British Columbia. It is also found on several other continents throughout the world. There are about 75 species of Tradescantia, some of which are hardy perennials and others which are grown as tropical plants. Most of the varieties you'll find for sale at your local garden center are hardy perennials and are hybrids of many species. 'Charlotte's Web' is an example of a popular gold-foliage form of spiderwort that is grown as a hardy perennial in zones 3-9, which encompasses most of the U.S. Its grassy textured foliage turns brighter gold in more sun exposure and more chartreuse in full shade. 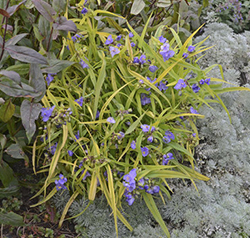 Small, three-petaled, blue flowers appear from early summer through late summer atop the 16-18" tall plants. The flowers close when you cut them, so plan to enjoy this wildflower outdoors in the garden rather than in a vase. For more technical information about native plants and to view regional maps, go to https://plants.usda.gov.